Now that the bankruptcy court has approved the plan for Detroit, including settlements with all of the city’s creditors, it’s a time for reflecting on what happened, what didn’t, and where the Detroit bankruptcy plan will lead. Given the prominence of foundations in the final contours of the plan, particularly the so-called “Grand Bargain,” in which foundations generated a significant sum of money to deal with the Detroit Institute of Art’s collection and the needs and expectations of pensioners, one of the most significant foundation players in the bankruptcy negotiations, Rip Rapson, the head of the Kresge Foundation, is now talking about the lessons learned and what’s next for the Motor City. Appearing at the Washington offices of the Aspen Institute, Rapson was interviewed by Aspen’s Jane Wales to talk about much more than Detroit, but even his answers on broad philanthropic trends could be seen expressed in Kresge’s interventions in Detroit—for example, in describing the process of his recruitment to Kresge, where he shifted the foundation from its long history as a funder of capital projects (libraries, hospitals, schools, museums, etc.) toward a more dynamic and, some might say, modern conception of private philanthropy. Part of Rapson’s vision, he said, was to “use the philanthropic enterprise to accelerate” things that probably wouldn’t be happening otherwise. Toward that end, Rapson cited Paul Ylvisaker’s famous comment that philanthropy could be—or should be—”America’s passing gear,” an instrument for social change. Rapson’s vision for a restructured Kresge Foundation was to “groundwire” the foundation to support opportunity for low-income people, to be invested in projects and programs for the long term, to partner with other institutions, and to take risks. On the issue of risk, he noted that in Kresge’s capital challenges, only one had ever “gone south” in 25 years of grantmaking, hardly evidence that the foundation was opening itself up to much risk. It’s not that Rapson abandoned the capital challenge grants, but he loosened the requirements for qualifying (which, for example, worked against applicants that were significantly publicly funded) and repositioned the capital grants as one of a “suite of interventions” calibrated to “make the most sense” for different fields. However, in light of the Grand Bargain and other initiatives that began prior to the bankruptcy, Rapson’s most significant impact on the foundation may have been getting it to focus on Detroit, doubling the foundation’s commitments to Detroit—even though, as a national foundation and a large one, 80 percent of Kresge’s grantmaking is still not in Detroit. Few people remember one of Ylvisaker’s lines preceding his “passing gear” statement, that “Philanthropy…over time has become a recognized social process…in effect, a set of private legislatures defining public problems, setting goals and priorities, and allocating resources toward the public good.” The question of “private legislatures” making decisions toward what might constitute the public good is a critical concern of contemporary philanthropy across the nation, but particularly in Detroit, where the municipal government’s processes had largely collapsed, partly due to the enormity of the fiscal Armageddon it faced, and somewhat due to its own internal problems of capacity or, in the case of mayor Kwame Kilpatrick, straight out corruption. With the city government’s substantial problems, the presence of a “remarkably vital philanthropic ecology in Detroit,” as Rapson phrased it, came to the fore, with foundations like Skillman dedicated to neighborhood-based school strategies, other foundations committed to open space, and so forth. But Rapson suggested that among the foundations, “folks were off in their own corners” and rarely talked. Kresge started the Detroit Neighborhood Forum, monthly meetings for foundations, banks, the city, the state, and nonprofits to communicate and share what they were working on, hopefully leading to collaborative working groups. For the massive and unprecedented bankruptcy, however, the philanthropic ecology needed to be expanded. With “a foot in local circumstances [and] a foot in national,” Kresge, according to Rapson, found itself in an “easier” position to talk to national foundations such as Ford and Knight, with Kresge serving as a “Sherpa” to help the outside foundations understand what they might encounter if they land in Detroit. With Kresge as a “national bridge” to outside foundations, Ford’s Darren Walker came into the picture and committed the New York-based but Michigan-rooted national foundation to be a significant player in the Grand Bargain. Rapson suggested that the Grand Bargain couldn’t have happened without Ford’s participation. Rapson dismisses the challenges to fashioning the foundation commitment to the bankruptcy solution as “remarkably easy because the stakes were so high.” “If we hadn’t taken the DIA out of play,” Rapson said, “it would have been in litigation for a decade,” with the museum caught in an “endless death spiral.” On the other side of the bankruptcy equation, the pensions were protected by the state constitution, so for the bankruptcy plan to proceed, the pension issue had to be taken off the table. In essence, that’s what the Grand Bargain accomplished. Experts will debate the elements of the Detroit bankruptcy plan for years to come—and Rapson indicated that scholars will likely be looking at the bankruptcy court’s deliberations as a model—but the question of foundations, or in Detroit’s case, private foundations and major businesses, acting as private legislatures cannot be passed by. Significant parts of Rapson’s discussion, partly due to the questions posed by Wales about the role of Dan Gilbert and Quicken Loans (Rapson said that Gilbert now owns 62 downtown office buildings containing somewhere between eight and ten million square feet of commercial office space), referenced his interactions with Gilbert and with Roger Penske: Gilbert’s downtown investment strategy served as the “flywheel”, in Rapson’s view, to restore confidence in Detroit’s central business district, introducing “micro street life” into Downtown where previously there had been little, convincing Quicken suppliers to move Downtown just as Quicken had with its initial move of 1,700 employees, but many more, and “re-enterprising the entrepreneurial energy” of the city. Penske also worked as Rapson’s partner in the promotion of the light rail line down the Woodward corridor; Penske, as the “most respected corporate leader in Michigan,” was able with Gilbert to get approvals and action from a Republican-dominated state legislature. Even with Kresge’s planning, apparently with the Brookings Institution, to create an “innovation district” along Woodward Avenue, the dynamic doesn’t include much of the public sector or the citizenry. Much of the dynamic feels like private legislatures promoting social change. However, Rapson points to the Detroit Future City plan, with extensive public input into its design and a continuing community process built into the program for going forward, as one clear example of the Kresge Foundation’s commitment to a grassroots, community-revived process. Still, adding in the roles of Kevyn Orr, the emergency financial manager who guided the city through the bankruptcy (Rapson described him as a “spectacular hire, but vilified by the community); the bankruptcy judge, Steven Rhodes, who crafted an unorthodox approach to the bankruptcy and led an “absolutely flawless” and “appeal-proof” bankruptcy trial; and U.S. District Court Judge Gerald Rosen, who served as Rhodes’ mediator, the cast of major players is largely without Detroit’s elected officials or public sector leaders—except for Michigan governor Rick Snyder. With the Grand Bargain and the Detroit Future Plan, it is impossible to see Kresge’s role—or for that matter, the actions of the collection of foundations in the process—as merely ordinary. Rather, the foundations (and big business players like Penske and Gilbert) were functioning as policy players, as in Ylvisaker’s frame, defining the problems, setting goals, and allocating resources. As Rapson acknowledged, though the foundation couldn’t lobby for specific legislative actions or governmental allocations, its work as well as the work of its foundation peers created the “preconditions” for things to be done. For example, in the light rail scenario, the discussions between Penske and Rapson regarding what Penske needed from Kresge as a financial commitment in order to attract other resources for this substantially though not totally privately financed infrastructure program put much of the onus onto the foundation’s money for making the project work. Given the city’s financial condition, and as Rapson learned, its limitations on being able to issue bonds for the project, if the light rail project were to proceed, it would be due to private capital, including philanthropic capital. Is there a democratic process at work somewhere in the Detroit bankruptcy scenario? Will democracy return to Detroit, given a process in recent times that had most decisions made by an externally appointed, unelected financial manager and plans largely made, structured, and financed by foundations, corporations, and law firms? Rapson sees the bankruptcy as really having had three components. One, which the city was simply incapable of doing, was “clearing out the debt”, and if that weren’t done, the creditors would have simply taken the city’s assets. The second, which returns to the question of governance, is the restructuring of city services. Detroit has been a national case study of public services, such as police, fire, garbage collection, streetlights, and, famously, water and sewerage, simply disintegrating. Rapson said that the restructuring of municipal services is Mayor Duggan’s top priority, but to do this, the mayor’s effectiveness will be dependent on the extent to which he legitimately involves the community. The third part, after clearing the debt and fixing the city’s provision of services, is, according to Rapson, what interested Judge Rhodes the most in his questioning of Rapson and his testimony in the bankruptcy trial. The judge, Rapson says, was interested in finding out what would be the long-term building blocks of a healthy community and emphasized that in Rapson’s testimony. The reality is, as Rapson acknowledged, “that’s what we need to go to work on.” The foundations can help with the city’s restructuring of services, though fundamentally that is the city’s job, and it will be up to the mayor and the city council to get their acts together so that the city ends up providing decent and reliable services. But the foundations have a role to play in building the neighborhoods. If there are “first principles” involved, they should include rebuilding the infrastructure of community-based organizations representing Detroit’s neighborhoods that have struggled to maintain neighborhood livability against the backdrop of decisions of corporations and politicians that starved neighborhoods of resources, support, and services. Rapson thinks that the Future City plan is a good starting point for thinking through the revival of democracy in a city that has had precious little democratic process in recent years. It may be, but the plan really is what it says it is: a plan, a guide for decision-makers, philanthropic grantmakers, and hopefully corporate investors to align their resources with priorities that consolidate and build Detroit neighborhoods. Kresge has funded an ongoing community engagement process for the plan, headed up by Ken Cockrel, a former mayor of Detroit (due to Kwame Kilpatrick’s resignation, though he then lost the mayoral election to Dave Bing) and member of the Detroit city council. Those of us who have kept an eye on the Detroit Future City Implementation Office that Cockrel heads have noted the agency’s positive rhetoric concerning equity, decision-making in the hands of regular Detroiters, partnerships with residents, advocates, and nonprofits. In addition, various projects have been announced by the office that seem to come with the participation of hundreds of residents in blight initiatives, neighborhood days, and district meetings to hear about the Implementation Office’s projects. But what about the mechanisms of city governance? What about the ability of Detroit citizens to pull the levers for choosing the allocation of resources? When it comes to decisions of governance, will Detroiters as voters be able to exercise their rights and responsibilities in the public space in ways comparable to the influence that Penske, Gilbert, and foundation leaders have been able to do in private interactions with sources of capital and state and federal leaders? That’s actually the challenge that Rapson knows as well as anyone. In his time in Minneapolis, he was the architect of community organizing processes that were meant to influence and control more than pools of philanthropic resources. His efforts were geared to empower residents of Minneapolis to affect and shape public policies that were at the core of determining the future of Minneapolis in terms of development policy and the allocation of public resources. There are no easy roadmaps for the path forward for Detroit’s citizens to regain control over the levers of government after so many years of being deprived of substantive control. When asked about how foundations can better support nonprofit advocacy, Rapson told a story from his days at the McKnight Foundation in Minneapolis. The foundation found itself intentionally funding the Metropolitan Council, headed by Walter Mondale’s son Ted, which was planning and encouraging significant housing development, and at the same time funding a fair housing challenge to the Metropolitan Council as well as efforts led by Myron Orfield, a nationally known fair housing advocate and litigator. According to Rapson, he received a call from Mondale asking how the McKnight Foundation could simultaneously fund the Metropolitan Council and its fair housing critics. Rapson’s response was, basically, let the best idea win. If democratic governance is going to be reestablished in Detroit, it may be helped by the organizational structures associated with the Detroit Future City plan, but ultimately, democracy isn’t organized top-down, but needs to build from the bottom up. 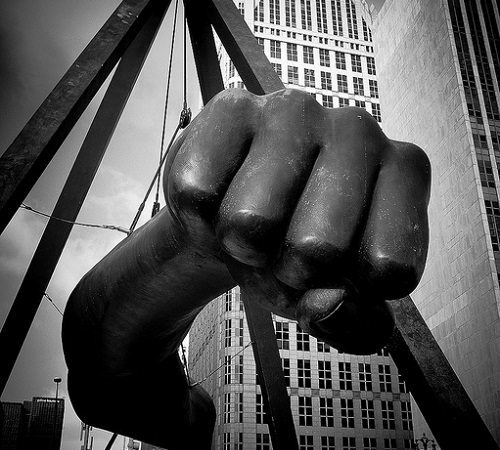 Hopefully, the Kresge Foundation and the other foundation funders in Detroit’s philanthropic ecosystem will provide organizing and advocacy support to grassroots Detroit groups across Detroit neighborhoods and then, rather than social engineering the outcomes, stand back and let the best ideas win. Disclosure: NPQ has previously but is not now receiving funding from the Kresge Foundation.